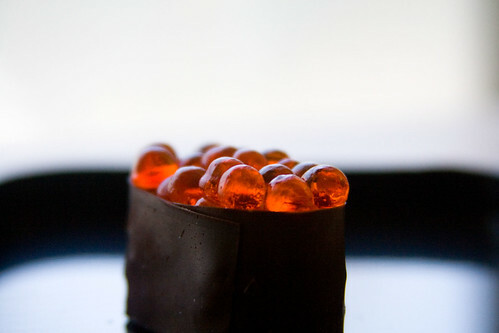 When you get deep into the sushi world, something that begins to come up is candy sushi. 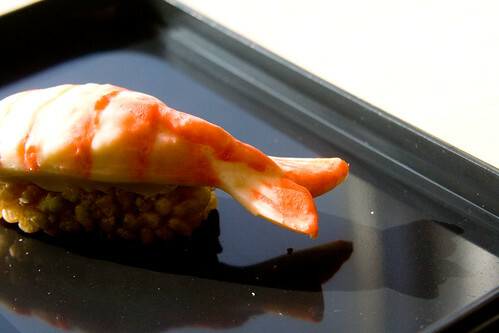 Often, people use Hostess Twinkies or Rice Crispy Treats as the sumeshi, with Fruit Roll-Ups for the nori. 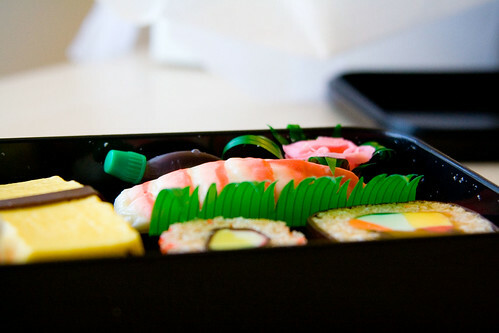 However, many have heard of Suedy’s Koo-Ki Sushi. These also use a rice crispy base, but use various types of chocolate, caramel, and gummy candies for their nori and sushi fillings. Often I have lusted over the delicious-sounding descriptions and beautiful pictures on their website, but I never believed I would actually try their candy sushi. At prices from $10 for a pair of chocolate chopsticks, to $65 for an entire bento box of candy sushi, the prices have always been a bit out of my range. A couple of weeks ago, my mom called me. “You have a package coming tomorrow, will you be home?” I assured her I would be, curious about this unexpected package. “You’re going to love it,” she promised. The next day, a delivery man came to my door with a light package. While I was signing for the box, he glanced at the return address, then looked at me with question in his eyes. “Sushi?” I smiled and nodded, not entirely sure what he was talking about. When I turned back into my apartment and took a look at the return address, my face lit up like a kid who just found out she gets to go to Disneyland. 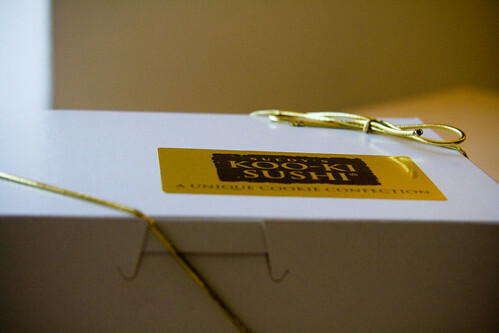 The name on the return address: Koo-Ki Sushi. Turns out my mom had known about my desire to try the Koo-Ki Sushi candy sushi, so my parents decided to get me the candy sushi as a graduation gift. (Thanks Mom and Dad!) I was the lucky recipient of a Black Suedy’s Obento and a pair of Milk Chocolate Mocha Bean Choc Sticks (chopsticks). They came wrapped in a protective padding so the chocolate wouldn’t move around, with ice packs so the chocolate wouldn’t melt during the trip. The first thing I did, after dancing around my apartment with a huge grin on my face of course, was take pictures of all the pieces in the box. Wouldn’t you? Heck yeah, you would. I had to sit on my hands the rest of the day so I wouldn’t get into the chocolate; I wanted to wait for Son to get home so we could both try every piece in the box. Believe it or not, we did somehow manage to practice restraint – we limited ourselves to two pieces of chocolate each day. 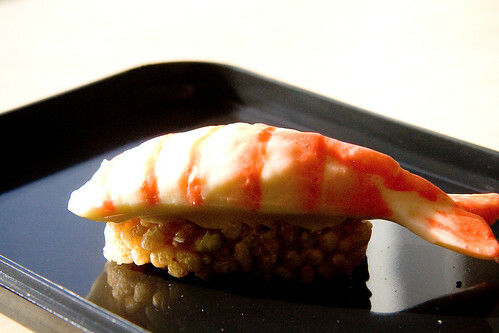 The first day, we just had to try the Apricot Row (gunkan-style maki) and Lemon-Egg (tamago nigiri). The Apricot Row was incredibly fun to eat. 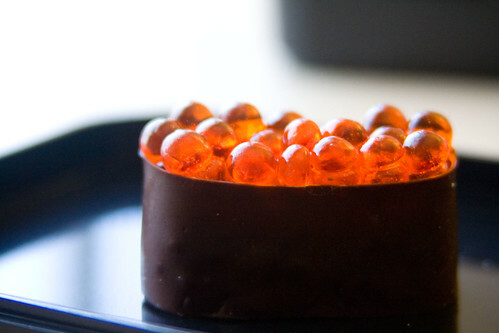 The “ikura” (salmon roe) were made of apricot-flavoured gummies, set on top of rice cookie “sumeshi” and wrapped with dark chocolate “nori.” The gummies were perfectly chewy, and although the texture was, of course, very different than a normal gunkan-maki would feel, it was delicious and enjoyable to eat. 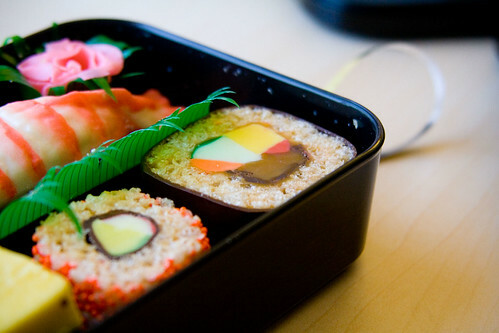 The Lemon-Egg was definitely my favorite Koo-Ki Sushi treat in the entire bento box. 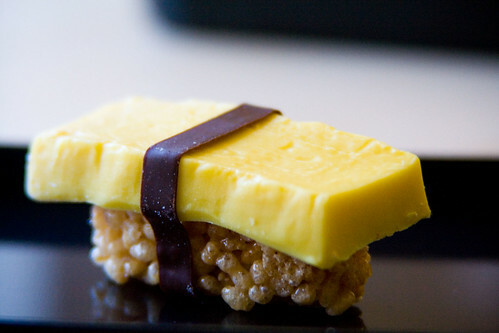 It consisted of a lemon-flavoured white chocolate “tamago” with lemon meringue filling, set on top of rice cookie “sumeshi” and wrapped with a very thin strip of dark chocolate “nori.” The lemon “tamago” tasted almost exactly like my favorite Girl Scout cookie of all time – a lemon sandwich cookie that used to be sold in my grandmother’s area. She used to always buy us several boxes, since they weren’t sold near us. (Side rant: I hate how the types of Girl Scout Cookies sold differs from district to district. Why not just have everyone sell the same cookies? Oh, how I miss those lemon sandwich cookies.) 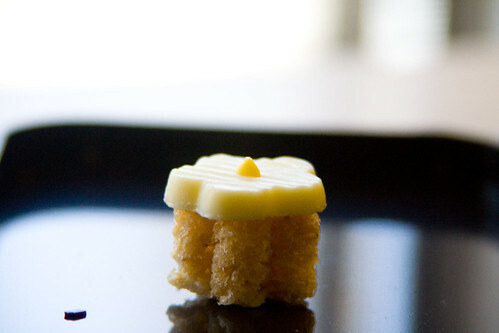 The white chocolate used for the “tamago” is incredibly creamy, and the rice cookie is perfectly crunchy, without being too dense. Next, we tried some of the garnishes that came with the “sushi.” The Peach Blossom was a little flower-shaped piece of peach-flavoured white chocolate, on top of a flower-shaped rice cookie. Small, perfect for when you don’t want a lot of sweet, and subtly peach flavoured. Delicious. On the other hand, the Green Tea “Wasabi” didn’t quite do it for me. I didn’t taste any green tea, so it just seemed like a normal lump of green-colored white chocolate to me. Son enjoyed the SUEDY’S “Shoga” (ginger), which was ginger-flavoured white chocolate. I’m not a huge ginger fan, so I didn’t much like it, but if you enjoy the taste of ginger (like Son does) then you will like the ginger piece. The last garnish was a little plastic fish filled with dark chocolate “shoyu.” The flavour of this really reminded me of Hershey’s Chocolate Syrup… not quite the same taste as “real” dark chocolate, but not a bad taste at all. 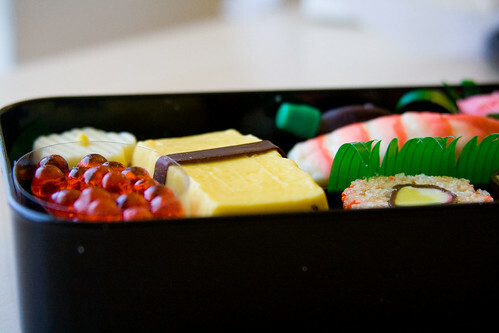 The last two pieces in the box were both “maki” pieces. The first we tried was the Fruit-O-Maki (futomaki) which consisted of caramel and fruit-flavoured white chocolate “fillings,” surrounded by rice cookie “sumeshi” and dark chocolate “nori.” I thoroughly enjoyed this one. The white chocolate was super melt-in-your-mouth creamy, and there was a perfect balance between the fillings and the “sumeshi.” My only critique for this piece was that the caramel was a bit too chewy, so it detracted a little from the mouth-feel of the piece. The Mau’i Maki (California Roll) was very interesting. 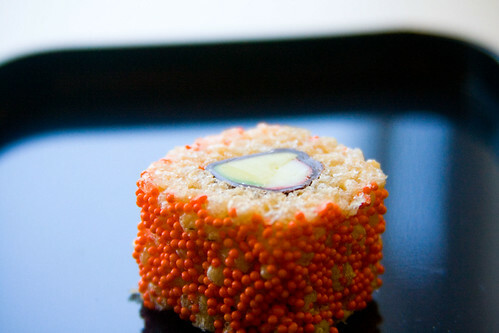 This one was an inside-out roll, with piña colada-flavoured fillings and candy “tobiko” sprinkles on the outside. I did not like the fillings at all – I don’t enjoy the piña colada taste one bit. However the “tobiko” were fantastic. The little candy sprinkles very closely replicated the crunchy popping texture of real tobiko, so I thought they were an excellent choice to complement the roll. But wait… we’re not done yet! 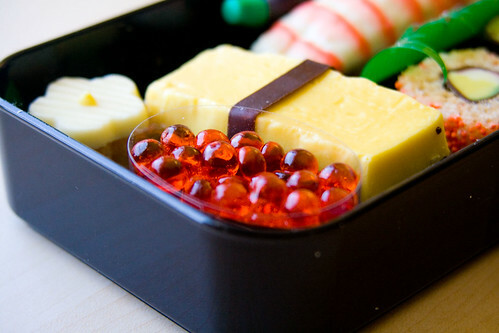 Although that was all the pieces in the bento box (which by the way, is a very adorable bento box that you can wash and re-use for real bento! 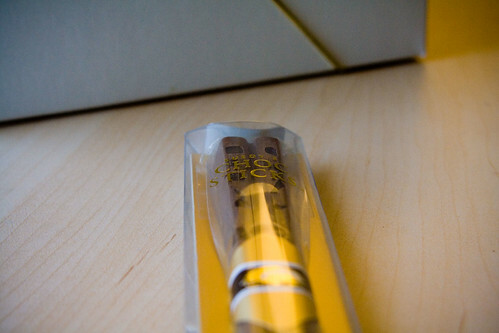 ), I also received a pair of Milk Chocolate Mocha Bean Choc Sticks (chopsticks) as well. These are both beautiful and delicious. On the package, it recommends swirling them into your coffee, which I’ll bet would be delicious. However, I chose to eat them by themselves. At the bottom of the chopsticks, you only taste the milk chocolate, but as you reach the upper third of the chopsticks, you find that beneath the gold-dusted design, there is a crunchy coffee-flavoured inlay. These were quite pleasing to eat and beautiful to look at… I would definitely buy them again and try swirling them in my coffee this time. All in all, I found that the Koo-Ki Sushi pieces were well-constructed, delicious, and worth their high price tag as a treat for special occasions. Would I make a habit of buying these? Most certainly not – my wallet wouldn’t survive a hit like that. However every once in a while, I wouldn’t mind trying these again. 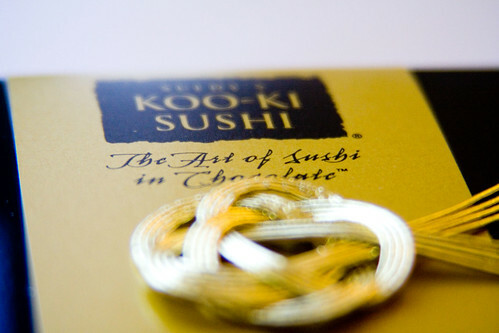 Koo-Ki Sushi ships everywhere in the United States, although there is an extra charge for shipments to Alaska and Hawaii. They do not ship to P.O. 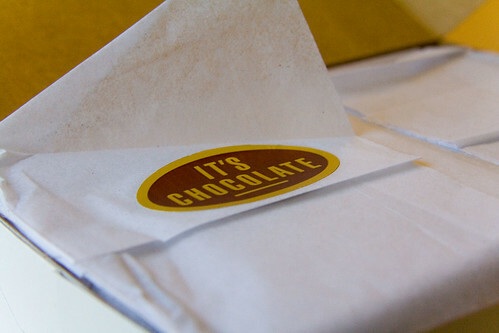 Boxes, and during summer months require overnight shipments to prevent melting of the chocolate. If you think the shipping costs are too expensive (and they are a bit pricey), you can also visit their store at 830 Jury Court, Suite 1, San Jose, CA, 95112. I’ve never even heard of candy sushi. They probably don’t have it in Australia 🙂 Pictures look great, I’ll have to hunt it down and try it someday! OK I consider this close enough to DQ sushi…well done. Yep, they really did a superb job of creating and designing these pieces so beautifully. I had no idea there was dessert Sushi. It never even occured to me to ask for dessert at our sushi restaraunt! Of course this is all so new to me…I’ve only been eating it since reading your blog…. Now what are you getting me into….. The only thing that my wife doesn’t adore about me, is that I won’t eat sushi with her. I have helped to make this better by giving her your site. Awesome job, Allison. I think she loves me even more now. 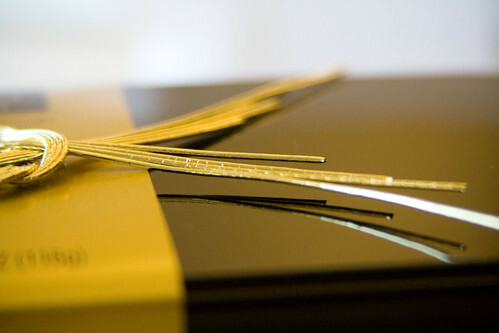 $10 choclate chopsticks? I might pay a buck extra for chocolate chopsticks while eating out. 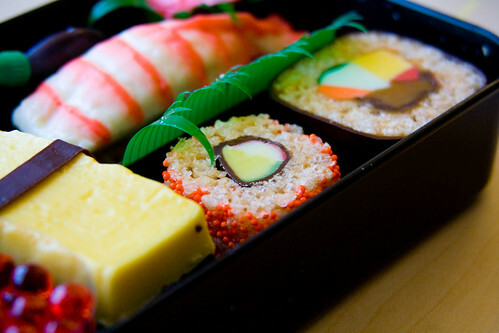 I would die to taste this sushi! they look delicious!